This exquisite vintage photograph captures three siblings posing for their portrait ant the Stone studio in Brooklyn, New York. The oldest child, a girl, is wearing a large straw hat. The two youngest children, possibly twin boys, are wearing sailor caps that display a decorative anchor. Each sibling is holding an item. The items include a ball, basket of flowers, and a walking stick. The photographer, Isaac C. M. Stone was born in England and immigrated to Brooklyn in 1884. He was a photographer in Brooklyn for twenty years. His death was announced in the Bulletin of Photography (1914). 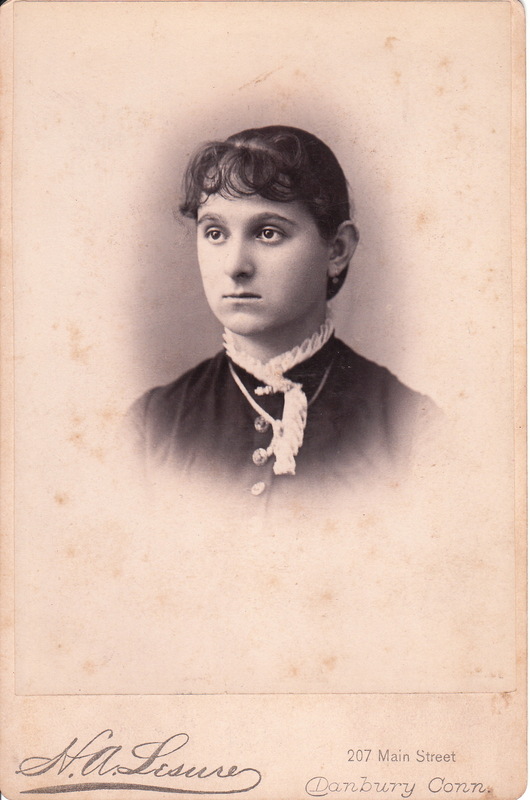 This cabinet card portrait features a wide-eyed young lady with curly bangs. One might posit that she was in her teen years when photographed by Harvey A. Lesure in Danbury, Connecticut. His studio is listed in business directories at 207 Main Street from 1885 through 1887. In 1888 and 1889 his studio was located at 247 Main Street. 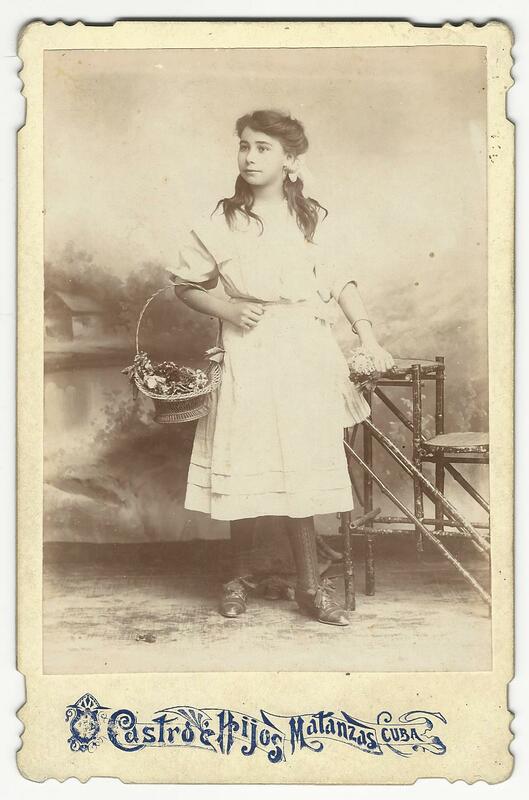 This cabinet card portrait features stage actress Jennie Calef. Variety (1917) offers a brief obituary for the actress. She was described as a noted soubrette who became a melodrama star in her later years. There are many articles about Jennie Calef in the newspaper archives. Most are brief and are concerned with announcing her appearances and providing reviews. Many of the articles mention Calef’s beauty. 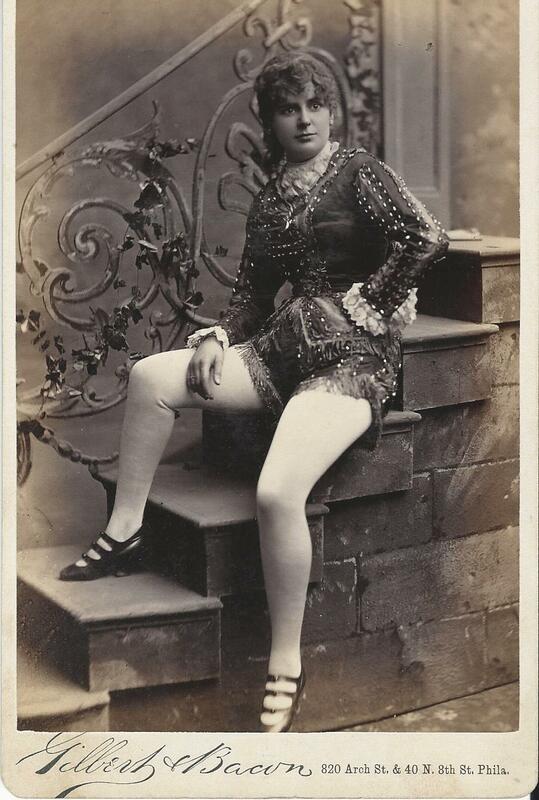 The Cornell Daily Sun (1883) hawks her appearance in M’liss at the Wilgus Opera House in Ithaca, New York. The newspaper quotes a review from the Richmond Sentinel, “Jennie Calef secures the enthusiasm of her audience from her first appearance, and retains it to the end. She is a charming actress”. A negative review can be found in The Daily Gazette– Fort Wayne Indiana (1885). The newspaper reports that “Jennie Calef, the actress who afflicted the people here in a bad play called Little Muffets is (now) devastating the Ohio towns.” It further reports that finances were becoming a problem for the theater company and that one of the “ham fat” actors of the company had taken legal action, attaching the shows baggage for his salary due. Another story concerning the actress is reported by Ohio’s Newark Daily Advocate (1886). The newspaper states that Jennie hurt one of her “beautiful limbs” while rushing onto a Sandusky, Ohio stage. The injury appears to have been to her knee. The article also asserts that she was confined to a Dayton, Ohio hotel room for two months in order to recover. She and a lawyer spoke to a judge about filing suit but the judge advised her not to pursue a law suit against the theater. An unconfirmed story was that the accident occurred when she slipped on some flowers that were given to her by her manager. Further articles indicate that she eventually did file a ten thousand dollar suit against the theater. The Sporting Life (1890) reports Calef’s marriage to Andrew Waldron who was her manager and an actor. Preliminary research failed to uncover details about the latter years of Jennie Calef’s life. This cabinet card portrait was produced by the studio of Gilbert & Bacon. To read more about the Philadelphia studio and it’s history, click on the category “Photographer: Gilbert & Bacon”. 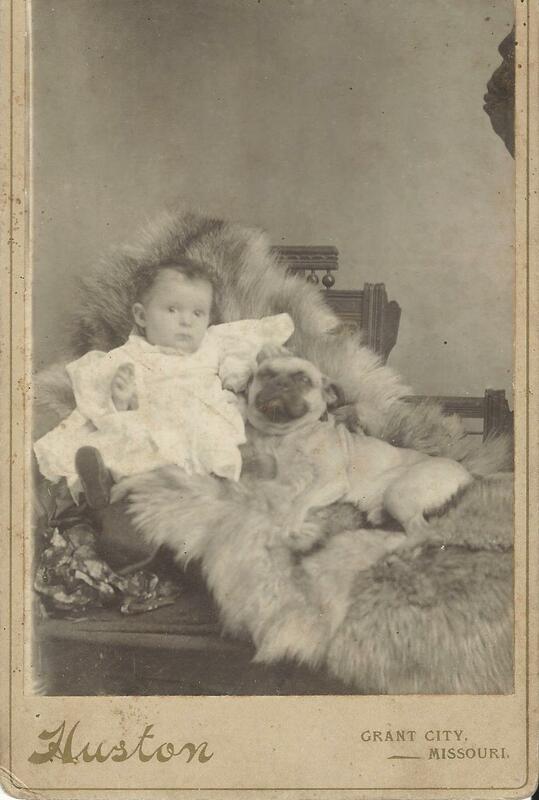 A baby and a pug sit together on a fur covered chair as they pose at Huston’s studio in Grant City, Missouri. There is no identifying information on the reverse of the photograph. According to one photographer directory, Jude Huston operated a studio in Grant City in the 1890’s. To view other photographs of dog, click on the cabinet card gallery category “Dogs”. 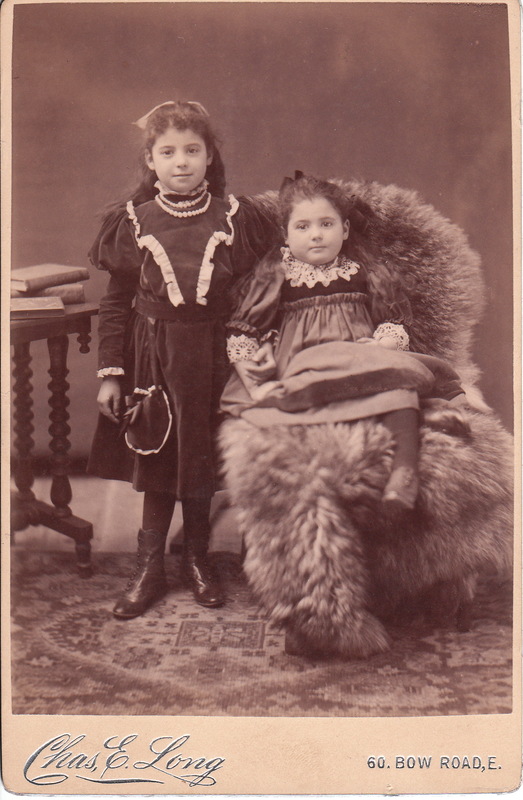 Judging by appearance, the two girls in this cabinet card portrait are sisters. 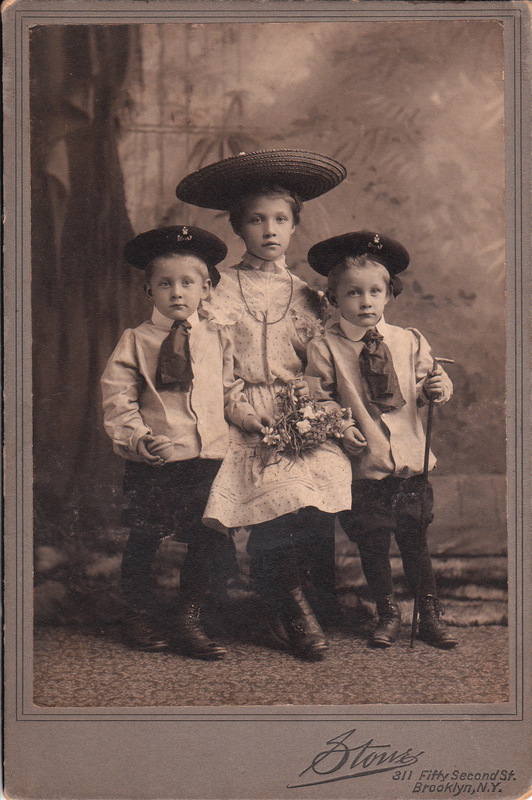 The older child is wearing a necklace and both children are wearing bows in their hair. The girls are dressed fashionably. The photographer is Charles E. Long who operated in London, England. He has posed the siblings in a typical studio pose. This image is one of countless cabinet card photos with images of fur covered chairs and tables topped with books. Two women pose for their portrait at the studio belonging to W. Allderige in Plainville, Connecticut. One of the ladies is holding a tennis racquet but she is holding it in a way that may indicate that she was not a tennis player. Since she is not displaying a proper grip of the racquet, the tennis racquet may just be a prop in the photographers studio. The previous owner of this photograph contended that the two women in this image are actually cross dressing men. Perhaps the former owner was just trying to increase the sales value of the photograph. I would be interested in hearing the opinion of some of the visitors to the cabinet card gallery on this matter. Research discovered some information about photographer William Allderige. He was born in Birmingham, England in 1854. He worked as a shipping clerk for a carrying company and then as a cashier and bookkeeper for a railway company. In 1856 he immigrated to the United States and settled briefly in Northampton, Massachusetts. He then moved to New York City where he studied photography and when proficient, he returned to Northampton and became a traveling photographer. His next business move was to open photography studios in Connecticut. In 1859 he opened a studio in Plainville which he operated for over forty years. He ran a studio in New Britain from 1870 through 1877 which his son took over and operated until 1898. In 1886 he started a studio in Farmington. Allderige was very busy conducting business but he still found time to marry Sarah Dawson in 1848. An adolescent girl holds a rolled paper as she poses for her portrait at the Hearn Studio in Union City, Pennsylvania. Is that a graduation certificate that she is holding? She is dressed fashionably. Her hat is strategically placed beside her. Her jewelry includes a necklace, bracelet, and a ring. Interestingly the photographer placed two faux rocks in front of her ankles so that her shoes cannot be seen. Is the photographer hiding something? Note the plants in the planter and the art object on the stage beside her. What exactly is that artistic piece? J. P. Hearn was a native of Devonshire, England, where he was born in 1846. 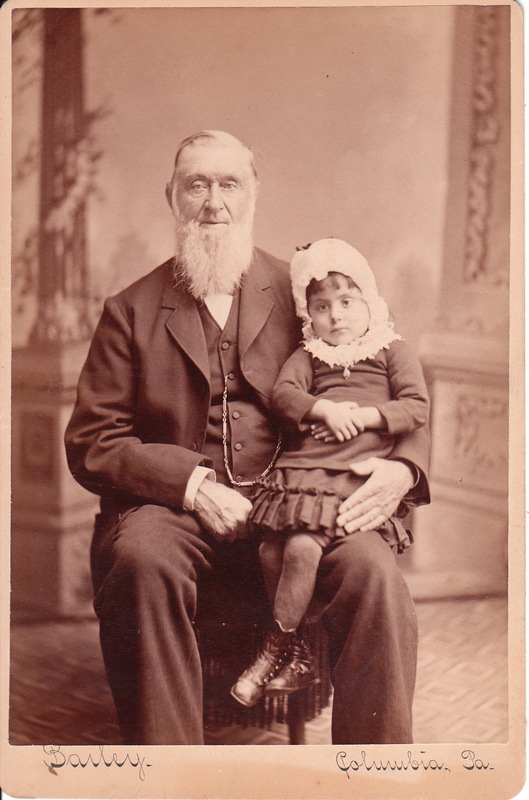 He immigrated to Ottawa, Canada with his brother John in 1872. He later moved to St. Catherine where he studied photography with G.F. Maitland. His next stop was Buffalo, New York. In 1875 he came to Union City and opened a photographic gallery which was destroyed in the “Brooklyn Fire” of 1879. After the fire, he was able to successfully rebuild his business in Union City. He married Canadian, Annie McClelland in 1878. Research found another cabinet card that indicates that at some point in time, Hearn operated studios simultaneously in the Pennsylvania cities of Union City and Spartansburg. A sweet looking little girl wearing gingham and lace poses for her portrait at the studio of F. Schanz in Fort Wayne, Indiana. She is wearing a high collar dress and the beginning of a smile. Note her wide eyes. 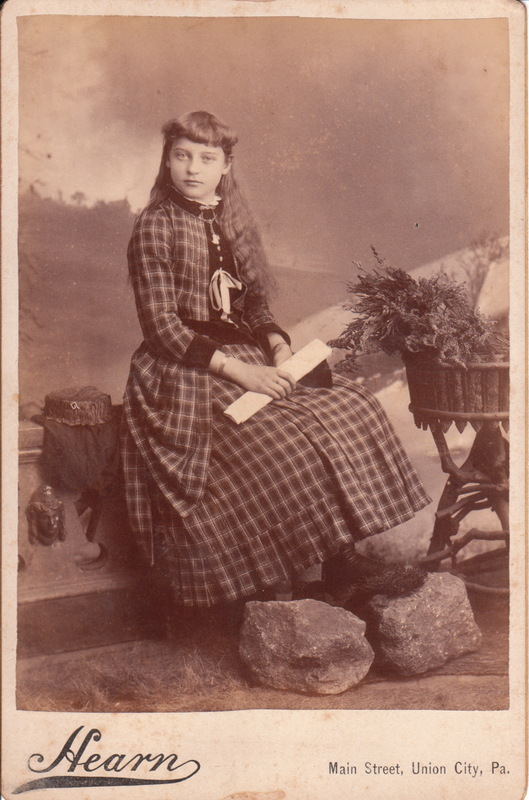 The reverse of the photograph identifies the young subject as being Ruth Wheelock. To view other photographs by Felix Schanz and to learn more about him, click on the category “Photogapher: Schanz”. Research reveals that Ruth Wheelock grew up to live an interesting life. She was born 6/29/1891. Her father, Kent Kane Wheelock (1857-1928), was a physician living in Fort Wayne. 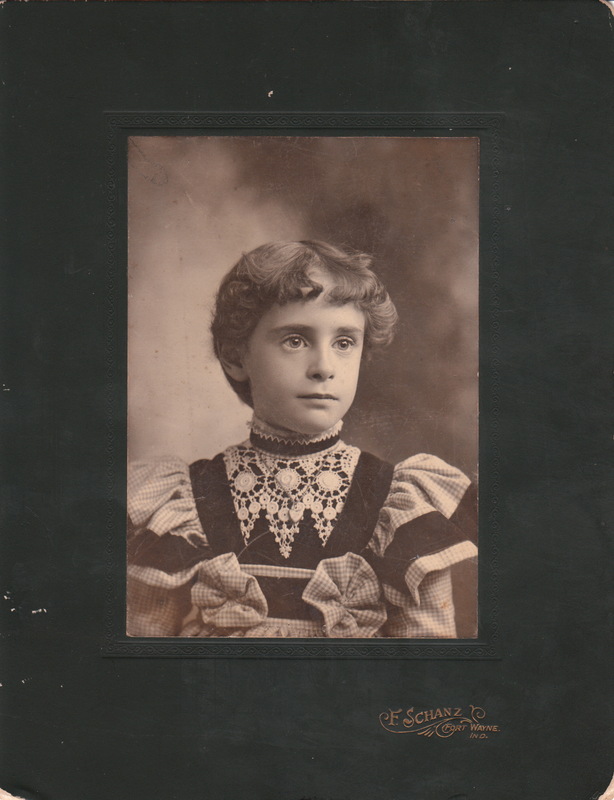 Ruth’s mother was Matilda Henderson (1858-1958). A Fort Wayne newspaper story (1907) reports that Ruth attended school out of state in Staunton, Virginia. After finishing school she did a lot of traveling abroad which is reflected in her many passport applications that can be found in the archives. Records indicate that at least through 1919 she spent much time working and traveling through Europe. She spent time in France, Spain, Italy, and likely other countries. She held a number of interesting jobs. She was a Spanish correspondent and translator with a large publishing house (in Buffalo, NY). She worked as a clerk in American Embassies in Europe. The 1920 census reveals that she was a clerk in the American embassy in Italy. She held the same job title at the American Embassy in Germany, according to the 1930 census. She also worked as a French correspondent for the Society of Fatherless Children in France. In addition, she worked as a teacher of language at the European School of Music. Ruth Wheelock lived what appears to be a very interesting life. She never married and died in Easton, Maryland on 8/11/1957.